So not being able to reassemble my T5200/100 is driving me nuts, and I don't want to spend > $100 for the sake of a floppy drive. Already spent quite a bit replacing the motherboard a year ago. - dead Toshiba portable (not laptop) with a 1.44, one that can't be fixed, because if it can I will fix it and have to repeat this process. Cash or trade - let me know what you're after. Is the adapter cable like this one? That would take me about five minutes to make; I build stuff like that all the time. Finding the 26-pin male connector might be the hard part but I'd bet I could just solder generic pinheader block in a pinch. It's the old 26 pin laptop/portable/keyboard standard to 34pin. Some wires are straight through, some are twisted, some are shifted, and it needs a mini-power plug to come out of the 26pin end too. Except for Pin 7, that can't be connected, its +5V on mine (not GND). 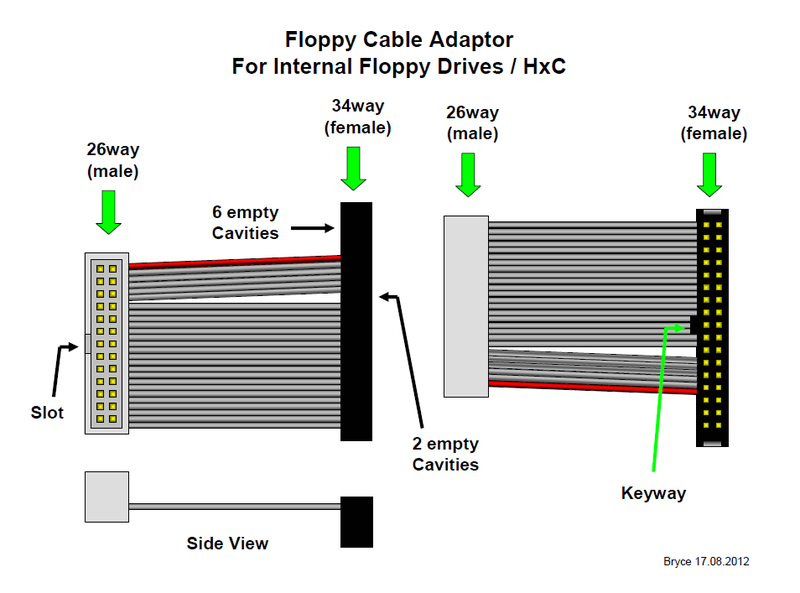 There was/is a guy who made them as a single cable, but they're only available now with a floppy drive for $70. I can't be guaranteed it'll work either, it just looks 95% likely according to other sources. I was crossing my fingers someone had a dead Toshiba lying around. That doesn't look very complicated, and I found a pinheader connector that would work from Jaycar here. I can certainly make you a prototype; won't necessarily be beautiful but it would (presumably) work. Shouldn't cost more than a few bucks. That would be amazing, sorry for the slow reply too btw. Just let me test a few pins to confirm. I want to make sure DS and Motor Enable are active low, and confirm if Pin 7 is +5 or GND (pretty sure it's +5V on mine). No problem, let me know if it's the right spec and I'll throw one together. I was going to go by the local electronics shop for some odds and ends later so I'll see if they have a compatible pinheader strip, otherwise we might have to order one of those sockets from Jaycar.